Undoubtedly, artist T.C. Steele continues to be the most frequently celebrated member of the nationally renowned Hoosier Group of painters who flourished during the late 1800s and early 1900s. Recently, though, the spotlight also has been on Steele's peer, colorful and cantankerous William J. Forsyth, who lived in the Irvington neighborhood of Indianapolis. 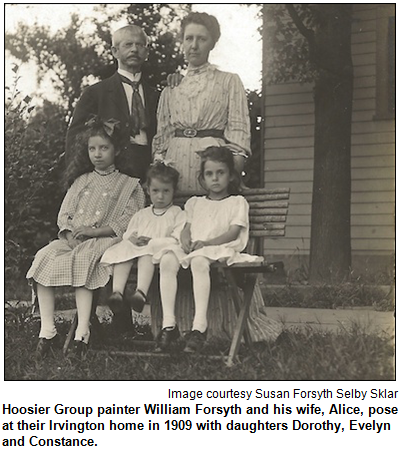 The life and career of Forsyth (1854-1935) are the focus of a new biography, and his paintings are featured in a retrospective exhibit at the Indiana State Museum. In addition, a cultural organization with which Forsyth was affiliated is about to celebrate a milestone. The Portfolio Club - which counted Forsyth, Steele and other influential Hoosiers among its members when the club was founded in 1890 - turns 125 years old this month. Forsyth served as its third president. 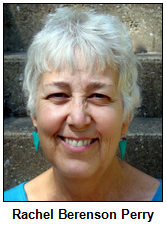 Rachel Berenson Perry, a well-known art historian based in Brown County. She is the author of William J. Forsyth: The Life and Work of an Indiana Artist (Indiana University Press, 2014). Rachel is the former fine arts curator of the Indiana State Museum; its current exhibit, William Forsyth: Only the Strong Persist, continues through March 29. 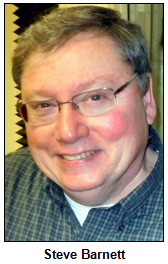 Steve Barnett, executive director of the Irvington Historical Society. He also is treasurer of the Portfolio Club, which was formed to support artists and encourage art appreciation among Hoosiers. And Wendy Boyle, current president of the Portfolio Club. 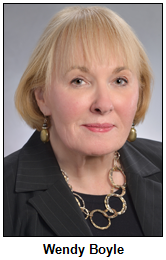 She is a fund-raising consultant whose clients have included the Fine Arts Society (now Classical Music Indy) and the Indianapolis Art Center. Forsyth was a key figure in founding what was then known as the John Herron Institute of Art in Indianapolis. As an instructor there through the early 1930s, he enormously influenced subsequent generations of Hoosier artists. Like other members of the Hoosier Group, Forsyth studied at the Royal Academy of Art in Munich. Although known for a fiery personality, Forsyth had a flair for teaching and was loyal to serious art students. In her biography, Rachel praises his constant experimentation with various art mediums, subjects and styles. In addition to Forsyth, members of the Portfolio Club during its long history have included architects Bernard and Kurt Vonnegut Sr. (the grandfather and father of the novelist); jazz photographer Duncan Schiedt, who died in 2014, and Ferdinand Schaefer, founder and conductor of the Indianapolis Symphony Orchestra. The Portfolio Club provides scholarships, including one that is endowed at what is now the Herron School of Art & Design at IUPUI. 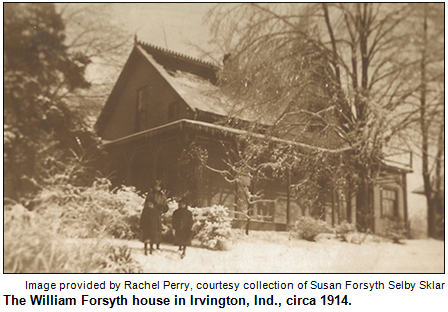 In Irvington, Forsyth and his family lived in a rambling house (with a studio next to it) near Pleasant Run Creek. Forsyth became an avid gardener; his house and studio have been demolished, but a historical marker was erected on the site in 1984. 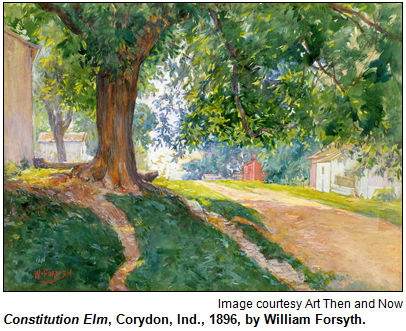 In addition to his paintings of Irvington and a range of sites across Indiana, Forsyth's works included drawings, painted china and even plaster sculptures. In her book, Rachel describes his experimentation as "fearless." He painted landscapes, as well as portraits, creating artwork with watercolors, oil on canvas, charcoal on paper and in other ways. During the 1920s, he spent summers at Winona Lake in northern Indiana and painted scenes there. Eventually, Rachel writes in her new book, Forsyth "exhibited more, won more awards and medals, and wrote more comprehensively about the Hoosier Group and Indiana art than Steele." The introduction to her book is written by Susan Forsyth Selby Sklar, the painter's granddaughter. Rachel's other books include T.C. Steele and the Society of Western Artists (IU Press, 2009). Historic Indianapolis, Forsyth's Irvington Connections. "Take U.S. 52 down to Rushville, perhaps stopping at the legendary Kopper Kettle in Morristown for lunch. But be hungry; the Kopper Kettle serves mounds of traditional food, family-style. Its over-the-top interior (especially at Christmas!) alone is worth stopping for. Or you might want to just wait until you get to Liberty." From Rushville, (the first of three county seats you'll see) head east on Ind. 44 to Liberty. You'll pass through Connersville, an old canal town and another county seat. Take heart, Liberty is not far! 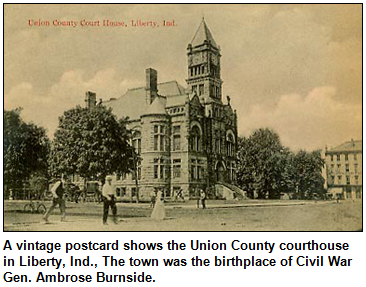 Yes, Liberty, Ind., is one of our smallest county seats, only a little over 2000. Most of its downtown is listed in the National Register of Historic Places and features numerous 19th- and some early 20th-century styles, great to explore. The focal point is the beautiful Richardsonian Romanesque courthouse built in 1890. Don't miss the New Deal-era post office, completed in 1937-38; go inside to see its mural Autumn Fields by Avery Johnson. The square also features interesting shops. Hungry? Try the Liberty Bell restaurant, a down-home place just a little south of the square on Main Street (Ind. 101). For lighter fare or an ice cream treat, Glory recommends J's Dairy Inn, 207 W. Union, just west across the tracks from the old depot. Perhaps most people know of Liberty through its proximity to Whitewater Memorial State Park, only a few miles south on Ind. 101, worth mentioning, of course! But if you're an explorer of old roads, you might want to take U.S. 27 southwest out of Liberty. Union County borders Ohio, and at the state line you'll find yourself in West College Corner, Ind., but a few steps later, in College Corner, Ohio. One post office serves both. Says Glory: "Love these state-line towns!" The Hoosier Group of artists included, in addition to William Forsyth and T.C. Steele, a painter whose son made a lasting cultural impact. The son, who grew up in Indianapolis, created the Raggedy Ann doll and books. His artistic father was a friend of Hoosier poet James Whitcomb Riley. The son, who became a cartoonist for the Indianapolis Star and other newspapers, is said to have based Raggedy Ann on his two favorite Riley poems, Little Orphant Annie and The Raggedy Man. The first book, Raggedy Ann Stories, was published in 1918. The floppy dolls were created as spinoff products to promote the book. 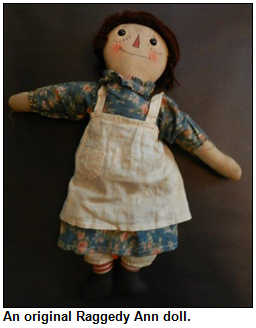 Question: Who was the Hoosier creator of Raggedy Ann? The prize pack is a gift certificate to Peterson's restaurant in Fishers, courtesy of Visit Indy. The call-in phone number is (317) 788-3314, and please do not try to win the prize if you have won any prize from WICR during the past two months. Please do not call in to the show until Nelson has posed the question on the air. Nine figure skating clubs across Indiana are affiliated with the U.S. Figure Skating Association. They include the Winter Club of Indianapolis, which is turning 75 years old and has been a part of the lives of thousands of Hoosiers, from preschoolers taking their first steps on ice to skating devotees in their 80s. Indiana also has produced Olympians in figure skating, as well as influential coaches and judges. Just as the national championships in figure skating are unfolding on network TV, Hoosier History Live will explore the heritage of the sport across Indiana, where well-known venues have included the Coliseum at the Indiana State Fairgrounds (it recently was renamed the Indiana Farmers Coliseum), the home of the Winter Club since 1940. Nelson's guests will include Patty Hagen, director of the "Learn to Skate" program at the Winter Club and the author of The Joy of Coaching (Professional Skaters Association, 2013). A former reporter for The Indianapolis Star, Patty lives in Carmel and has been teaching group and private lessons since the 1980s. The evolution of figure skating in Indiana was affected by some historic tragedies. They included a plane crash in Belgium during February 1961 that killed top American skaters and coaches. Among the fatalities was Danny Ryan, a coach in Indianapolis who had been the first American to win a medal in ice dancing at a world championship. An explosion at the Coliseum on Halloween night of 1963 - during a Holiday on Ice show - also affected the lives and training of Hoosier skaters. On the positive side, Hoosier figure skaters who have competed in the Olympics included brother-sister pairs team from Marion of Wayne and Natalie "Kim" Seybold (who were crowd favorites during the 1988 Calgary Olympics) and Jill Watson of Bloomington, who won a bronze medal, also at the 1988 Olympics. Wayne Seybold, currently the mayor of Marion, and his sister were guests on a Hoosier History Live show in 2010 about their careers. Influential Hoosier coaches have included Sandy Schwomeyer Lamb, a Shortridge High School graduate who pioneered figure skating as a sport in the Special Olympics. Her sister, Judy Schwomeyer Sladky, is considered a pioneer in ice dancing, which did not become an Olympic sport until 1976. Many accomplished skaters were influenced by the late Pieter Kollen, who coached at the Indiana/World Skating Academy at Pan American Plaza in Indy. In 2012, the academy moved to another well-known venue - the Carmel Ice Skadium - prior to the closing of the ice rinks at Pan Am Plaza. In addition to figure skating clubs in central Indiana, others affiliated with the U.S. Figure Skating Association include clubs in Fort Wayne, South Bend, Columbus and Evansville.